This tutorial shows you how to process your own chickens for meat. These could be breeds specifically designed for meat production, or laying hens that are old and no longer laying. The process is the same. It’s also similar for turkeys and other poultry. Knives: Two or more, very sharp, 4 to 6 inches in length. 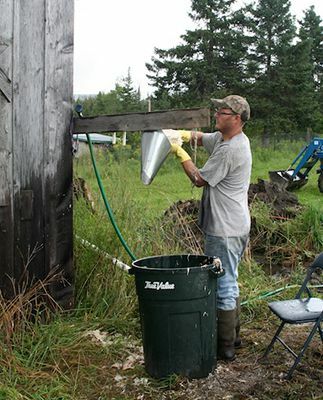 Killing cone: A special metal cone for poultry; find it at hatcheries or farm supply stores. Buckets and/or pails: You’ll need a bucket under the killing cone for catching the blood and feathers and one for the guts and other discarded pieces. Water: A steady supply of fresh water, such as from a garden hose, is necessary. You’ll be rinsing your tools, hands, and the bird after every step. Gloves: Optional, but makes the process a lot easier. Old clothes: You’ll be getting messy. Table: A table covered with a tarp is needed to eviscerate and process the bird. Scalding Tank: You need a very large stockpot or turkey fryer, filled with water, over a burner. We found a turkey fryer that comes with a propane burner, connected to a tank of propane, works well for us. The pot needs to be large enough to dunk the birds in with enough room to swirl them around a little bit. This is critical for proper scalding which makes plucking easier. Thermometer: For taking the scalding water temperature. A cooler with ice/water is also needed. When you’re done processing the birds, you’ll place them in the cooler to chill for a few hours. Paper towels: For wiping up. Cutting board: A cutting surface. Zip-close plastic bags for storage. One to two gallons in size is ideal for chickens. Go ahead and grab your first bird. Hold the bird by the feet and let it hang upside down. This calms the bird as the blood rushes to its head. Place the bird in the killing cone. Pull the bird’s head firmly through the bottom of the killing cone and hold it. Using your sharpest knife, cut just behind where the tendon attaches to the beak and tongue. You’ll feel a hard piece of cartilage behind the jaw attachment. You want to sever the jugular vein and carotid artery. Make a deep, firm slice on both sides of the neck. Pull the head down firmly and allow the blood to drain. At this point, the bird will kick and jerk. Remain calm. This a normal part of the process, although it can be stressful. The bird is unconscious and not aware of anything at this point. When the blood has completely drained and the bird is still, you can move on to the next step. Make sure your water temperature is 135​ F to 140​ ​F for ideal scalding. Remove the bird from the killing cone and hold it by the feet and/or legs. Dunk the bird headfirst into the scalding tank, gently swirling it in the water both around and up and down. Make sure to get all the leg feathers in the water. Check the scald by rubbing your hand or fingers against the grain of the feathers on the leg, and by plucking a large feather like a wing or tail feather. If the feathers don’t pluck easily, more time is needed. A ​scald that's too long will damage the skin, making it tear easily and affects the length of time the poultry can be stored; don’t scald too long. As soon as the feathers come out easily, the scald is done. For our setup, we hung the bird by the feet from the plank of wood where we hung the killing cone with a string with hooks at each end (similar to a bungee cord). The pail was underneath so that feathers just fell into the pail and we could easily use the hose to rinse off the bird after plucking. You can also lay the bird on the cutting board on your processing table. Remove the feathers by rubbing your thumb and fingers against the grain of the feathers rather than trying to pluck each tiny feather individually. For the larger wing and tail feathers, pluck only one or a few at a time to avoid tearing the skin. The larger breast feathers, wing, and tail feathers leave “pins” in the skin sometimes. Poultry processing supply stores sell a “pinning knife” that’s dull, similar to a butter spreader. Scraping the pinning knife gently along the surface of the skin helps remove the remains of pin feathers. After plucking, give the bird a good rinse with the hose to remove any loose feathers. The oil or preen gland must be removed or it can ruin the taste of the meat. Make a cut above the gland and cut all the way down to the bone. Slide the knife along the bone, ending at the tail. Make sure there is no yellow glandular tissue left on the bird. Straighten the leg and cut between the joints to remove the chicken’s feet. Using a sharp knife or cleaver, cut right through the bone to remove the head. Slit the skin along the back of the neck and slide it down. Separate the trachea and esophagus from the neck. Loosen the trachea and esophagus all the way down to where they enter the body cavity. You should feel the crop; if you starved the bird before slaughter, it will be empty. Loosen the crop from the skin. Carefully pull the crop free of the body and leave the trachea, esophagus, and crop hanging free of the body until the next step. Insert the knife about one inch above the vent. Slit the skin open up to the breastbone. In both these steps, be very careful not to cut into the intestines. Carefully cut around the vent on either side of it. Pull the vent free of the body and the intestines will follow. The final step is to reach into the bird and run your hand down along the sides of the ribs to free the entrails. Find the gizzard, which is a hard, somewhat round organ. Pull the gizzard out and the entrails will follow. If you’ve loosened the trachea, esophagus, and crop, they should also come out with the entrails. If they don’t, you can remove them separately. You’ll need to go back in and get the lungs. You can usually feel them by inserting your hand into the body cavity and following along the outline of the ribs to the spine. Sometimes they break into pieces, so keep going back in until you don’t feel any more squishy lung tissue. There is also a tool called a “lung scraper” that may help with this step, available from poultry processing suppliers. Remove the neck by first cutting the muscle tissue around the bone, then bending it and breaking through the bone. Birds should chill in the ice-water solution for at least 30 minutes, though one hour is better. After chilling, remove the bird from the ice water, lay on paper towels, and pat it dry. You can then store the bird in a large (1- to 2-gallon) Ziploc bag in the refrigerator. The meat should age for a few days before eating it or freezing, allowing the muscles to go through rigor mortis and then relax. Birds that haven’t aged will be tough and hard to eat. For 6- to 8-week-old broilers, age 36 hours. For 10- to 12-week-old birds, for a full 48 hours. For the final cleanup, make sure to wash everything you used – knives, thermometer, pails, killing cone, tarp/tablecloth, etc. – with a diluted bleach solution and rinse with water.